Set in 1941 during the weeks leading up to the attack on Pearl Harbor, and inspired by true events, Wetzork imagines the relationship between African-American architect Paul Revere Williams (designer of landmark L.A. buildings including Saks Fifth Ave and the Los Angeles County Courthouse, as well as private residences for Bert Lahr, Lucille Ball and Desi Arnaz, and Frank Sinatra) and a wealthy American couple who employed him to design a compound and training ground for Nazi sympathizers. The ruins of an abandoned WWII Nazi compound in Pacific Palisades, known today as the ‘Murphy Ranch,’ are the inspiration for this new play. 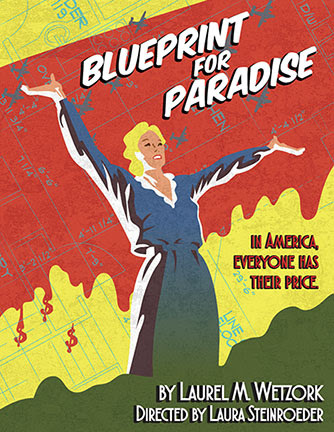 The Athena Cats presents the world premiere of Blueprint for Paradise by Laurel M.Wetzork, opening July 30 at the Hudson Theatres in Hollywood. For more information, check out www.BlueprintForParadise.com.